The Wood Warbler is a scarce bird in Cheshire and Wirral, having declined greatly in the last decade or so. Breeding Bird Survey results from the BTO show that the UK population dropped by 52% from 1994 to 2004, for unknown reasons, and it is now on the Amber List of species of conservation concern. This bird lives up to its English name: it is the Phylloscopus warbler of mature woodland, and all but one of the habitat codes recorded in this survey were group A (woodland). Its requirements are quite specific: climax woodland, usually deciduous, with at least a 70% closed canopy and little ground cover. Such habitat is mainly located in western Britain, but Wood Warblers have also been found quite widely but thinly distributed across much of lowland England. Suitable habitat is in short supply in the county and is mainly at the higher altitudes, in east Cheshire including Alderley Edge, the mid-Cheshire Sandstone Ridge and Caldy Hill on Wirral. Favoured sites are visited year after year, often by the same individuals. From 1981 to 1993, 8 out of the 29 (28%) Wood Warbler males ringed in Delamere Forest are known to have returned in a subsequent year (Norman 1994). The suitable area of Delamere Forest supported a small and variable population, from one to eight males each year to 2001. In only half of the years, however, was a female present, and then no more than one in a year. From 2002 to 2005 no birds stayed for more than an odd day, but in 2006 two males set up territory, although neither was successful in attracting a mate. One of them held exactly the same territory used by the last pair of Wood Warblers that successfully nested in the forest, in 2001. The female builds a domed nest on the ground, often on a slope, with the nest frequently close to a small bush that provides a perch on the way in to feed their chicks. Nests can be easy to find, but the main way of proving breeding is from hearing adults giving alarm calls then seeing them carrying food, usually in mid- or late-June. Recently-fledged young are all-but impossible to locate, spending all of their time high in the canopy and rapidly leaving their natal area. Outside the breeding season, little is known about Wood Warblers in Britain: few are seen or caught on migration. They are one of the few migrants to fly south-east in autumn, apparently moving to Italy to fatten-up then seemingly crossing the Mediterranean and the central part of the Sahara desert in one long flight. The wintering grounds probably lie from the Ivory Coast to the Congo basin, around the equator, although it is not known where British birds go within this range, as no British-ringed bird has been reported from its winter quarters (Migration Atlas). This Atlas map greatly overstates the species’ distribution. 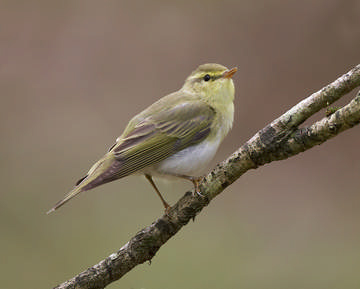 Most tetrads recorded ‘possible’ breeding only, usually with a male Wood Warbler present and singing, often only for a day or two: for one quarter of the records, the observer specifically noted that the bird was present for one morning only. Even when they stay for longer, some birds hold territory for several weeks without attracting a mate (Norman 1994). They sing almost non-stop, mixing two completely different songs, a stuttering, descendent trill and a loud, shrill ‘peu peu peu’, like a repetition of their alarm call, with much of their song given in flight around the territory. Males often sing close to each other, and are more effective in attracting females to their vicinity than solo males. If they find a mate, many males then set up a second territory whilst the female incubates their eggs, and try to attract another female. The second territory is typically 800 m away and out of earshot of the bird on the nest; they return to their primary territory every 30 or 40 minutes. All these aspects of their behaviour mean that, without careful study, the population can be exaggerated. 80 singing males were recorded in Cheshire (without Wirral) in the 1984 national survey (Bibby 1989), two-thirds of them east of the SJ80 longitude line. During this Atlas survey the county may have been visited by some 10 or 20 Wood Warblers in a year but the breeding population is only in single figures.